Just six days to election and the NDC is facing a major crisis in its ranks. By the close of work yesterday, ADM was still following impeccable leads into a story that points to a cataclysmic hiccup in the NDC. 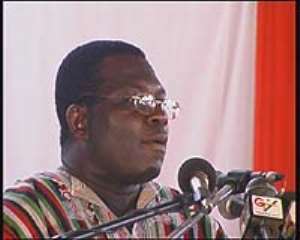 The General Secretary of the party, Dr. Josiah Aryeh has offered to resign from his party. Instead of his party colleagues trying to figure out his genuine concerns, they have rather cobbled up a number of meetings to get him to pass the blame to the NPP. A source who leaked Josiah Aryeh's intention to ADM said "despite the man's pugnacious attributes, he is a very worried and broken man." Evidence, he said, exists to show that Dr. Josiah Aryeh has "poured his heart out to a number of people" about the dangerous path the NDC is taking in trying to turn Ghana into another Liberia, Sierra Leone or Cote d'Ivoire and he does not want to be a part of it, at least, not under his watch as General Secretary. He is not happy at all, said the source, with "Rawlings running riot" and no one in the party having the moral courage to call him to order. As General Secretary, he seems to have lost the confidence of the two main factions in the party - the Rawlings and Obed factions. Neither side trusts him as he dangles precariously between the anger of Rawlings and steely personality of Obed Asamoah. On a bread and butter level, the NDC scribe is said to be the most poorly resourced General Secretary of Ghana's political parties. Nobody simply gives a damn about him, hence his inability to be on the campaign trail like some of his colleagues. He does not have an imprest sufficient enough to let him move about and often has to dip his hands into his meagre lecturer's salary to fund party work. "The man is very frightened", said the source, "because the resurgence of the so called cadres in the NDC means that Rawlings has taken over the party and it does not bode well at all for the country. The man can see bloodshed and does not like it." Dr. Josiah Aryeh, like some of the latter-day NDC apparatchiks joined the party purely out of the desire to be seen and heard and not any deep-seated conviction about the NDC's antecedents in coups and violence. Yet to be dispelled rumours even talk of his "refugee" status in Europe when the PNDC was in power. Whatever would come out of this threat or decision to resign, Dr. Josiah Aryeh is on his way out and the final disintegration of the NDC may come more from an implosion than the defeat the party would suffer at the polls in a few days time.